Are you an avid gardener? If your answer to that question is ‘yes’, then you should have one of the best garden wheelbarrows for your garden. However, if you just checked and realised that you don’t have one, then you should definitely take a look at our top 7. Who knows when there might be a heavy load that needs to be transported from one end of the garden to the other? Alternatively, a garden tipper cart is also great for transporting plant pots, soil, mulch, coal, bricks, etc. Furthermore, it has 4 wheels, so it’s like a 4 wheel wheelbarrow, which requires less strength and it’s always balanced! 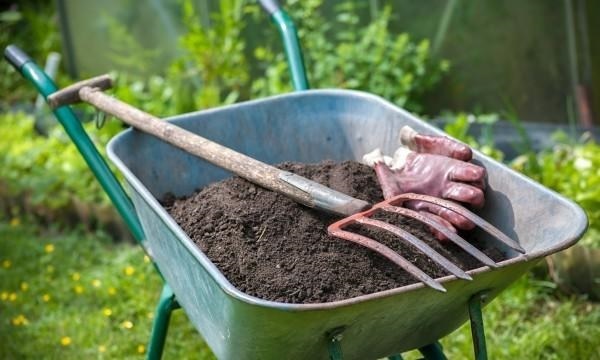 You never know when you might require a wheelbarrow, especially if you’re doing some gardening or DIY, so you should definitely have one ready at all times. But it can’t just be any old wheelbarrow, it should be one most suited for you, which is why we’re here to help you find the ideal wheelbarrow. Has a capacity of 85 litres (dimensions of: 83.6 x 62 x 28 cm). Galvanised main barrow, glossy green frame, and a sturdy yellow wheel. Requires some simply assembly before use. 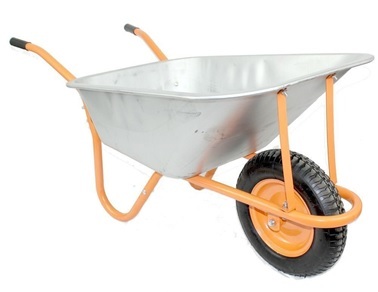 Walsall’s galvanised wheelbarrow can carry up to 85 litres thanks to its large dimensions. Before you can use it, you will have to do some assembling, but then once that’s over and done with, you can stare at it in awe and put it to good use. Its wheel is definitely the highlight – it doesn’t squeak, and it is also puncture-proof. Now, you don’t have to worry about all the small stones along the way. Has a capacity of 90 litres (dimensions of: 58 x 122 x 58 cm). Made of steel with an under pan support. Sturdy 14” pneumatic tyre that can support the load. Requires some assembling before hand. Short handles slide off easily. 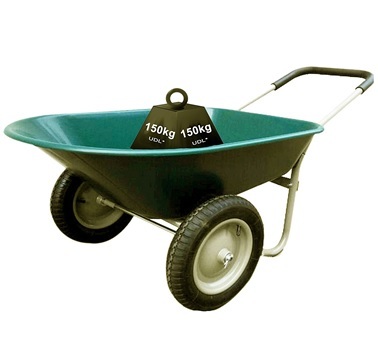 This heavy duty metal wheelbarrow can carry upto 180kg or it can carry upto 90 litres. It is large, and it can aid your garden work, thanks to its sturdy steel build and under pan support. It is equipped with a 14” pneumatic tyre, which can be inflated easily. Before you can use this heavy duty wheelbarrow, though, you’ll have to assemble it together! Can carry up to 85 litres or 120 kg (dimensions of: 82.8 x 61.8 x 10.9 cm). 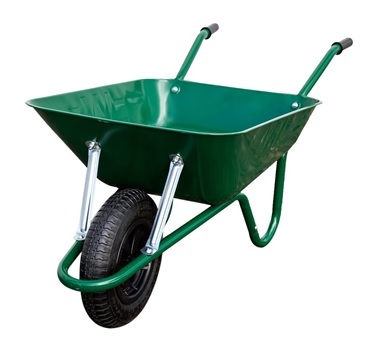 British made metal wheelbarrow has been finished in a glossy green. Equipped with a 3.5 x 8 pneumatic tyre. Won’t rust easily if stored outside. Before use, must be assembled. The wheel is of cheap quality and may not withstand a heavy load. Are you looking for a heavy duty wheelbarrow at a reasonable price? Well, you might have just found the one. This one has a green finish and can be left outside without worry. It can carry upto 85 litres or 120kg, so that you don’t have to make as many trips around the garden. Easily manoeuvrable with the pneumatic tyre, so you won’t ever have to face the problem of not being able to get from one place to another. Has a capacity of 55 litres and can carry upto 150kg (dimensions of: 2.8 x 6.4 x 9.5 cm). Hopper is made of polypropylene that you can count on to hold the load. Double wheels allows complete control over the wheelbarrow. Pneumatic wheels are durable and suitable for a large range of terrains. Clear instructions will help guide you assemble it. Split pin that holds the wheel to the barrow isn’t sturdy. Do you prefer 2 wheel wheelbarrows over the traditional one wheelbarrow? We can understand – after all, two wheel wheelbarrows tend to be more balanced. This particular one has two pneumatic wheels, which are suitable for various terrains. 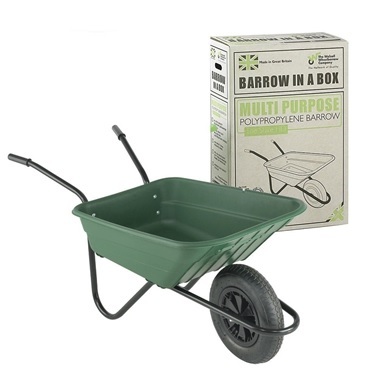 These two wheels paired with a polypropylene hopper can carry 55 litres or 150kg, so you can rely on this wheelbarrow! Can carry upto 65 litres or 100kg (dimensions of: 55 x 77 x 21cm). 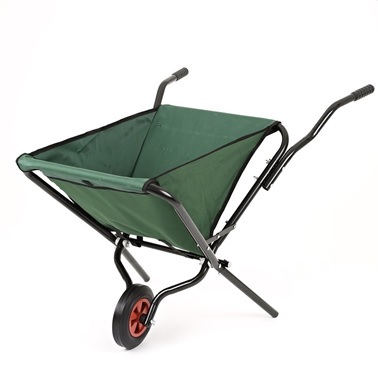 Don’t worry about rusting – the barrow is galvanised and the frame is painted green. Equipped with a 12” pneumatic tyre. Handles allow for good grip with smooth indentations. Barrow is actually quite weak and can’t carry upto stated weight. 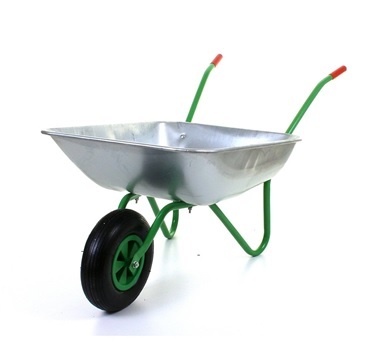 If rain is a frequent occurrence where you live, then you’ll love the fact that this wheelbarrow is galvanised. So if you ever realise that it’s raining cats and dogs outside, you don’t have to worry about your wheelbarrow rusting. When you’re doing actual work with the wheelbarrow, though, you can count on the barrow carrying the load and the pneumatic tyre guiding you! Can carry up to 50kg (dimensions of: 120 x 56 x 85cm). Sturdy steel frame has a powder coated metal rim, so that it doesn’t rust. Frame also includes a stand, so that you can set the wheelbarrow down. Fabric barrow with extra pouches – you can never have enough storage. Equipped with a 13” solid tyre. This wheelbarrow can be folded – never fret over space again! Solid wheel makes it difficult for wheelbarrow to be manoeuvre. Perhaps you value space over everything else – if you do, this folding wheelbarrow will succeed in charming you most. The barrow itself is made of fabric and comes with sewed on pouches to store whatever you want. Even better, you don’t have to worry about your tyre deflating since it is solid, rather than pneumatic. While this wheelbarrow can’t carry as much as other ones, it still does its job pretty well. Can carry upto 90 litres (dimensions of: 88 x 55 x 22cm). Despite the lightness of wheelbarrow, it is still strong. Handles provide a comfortable and stable grip. Equipped with a 15” pneumatic tyre, which can help you guide the wheelbarrow. Tubular frame is coated in power. 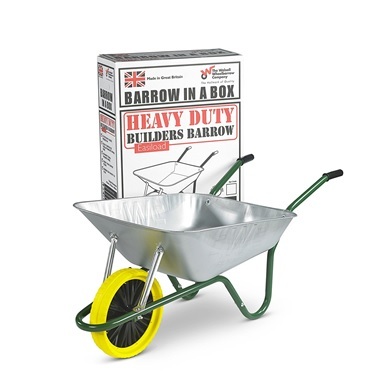 This heavy duty plastic wheelbarrow is light, but it can still carry a lot! Its handles provide a comfortable and stable grip, so you don’t have to worry about accidentally letting go of the wheelbarrow and dropping everything in it. Its 15” pneumatic tyre is also reliable – it will help carry the load, as well as guide you!